As mayor of San Francisco, Lt. Gov. Gavin Newsom was a darling of the city's business community, steered the city through massive deficits to balanced budgets, had good relationships with police and was viewed by the city's progressive faction as a moderate politician -- even conservative, by San Francisco standards. Now, as Newsom runs to succeed Gov. Jerry Brown, he's walking a fine line: Trying to convince more moderate voters that he would continue the fiscal discipline Brown has championed and also be able to enact a litany of ambitious progressive policies, including single-payer health care, universal preschool, truly tackling housing and homelessness, and investing more in higher education. Newsom is the apparent front-runner in a crowded field for governor and appears poised to easily claim the top position in the June 5 primary, guaranteeing him a spot in the November runoff. Republican businessman John Cox and Democratic former Los Angeles Mayor Antonio Villaraigosa are vying for second place. Recent polls show Cox ahead, but Newsom sees Villaraigosa as a bigger threat, given Republicans' dismal registration numbers in California and the fact that Villaraigosa has positioned himself to the right of Newsom in this race. 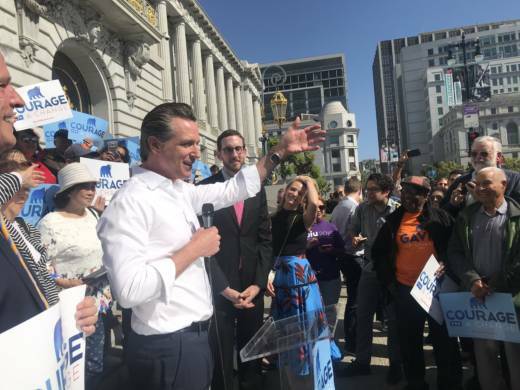 So, as Newsom makes his final case to voters on a 30-city bus tour ahead of Tuesday's primary, he is also laying the groundwork for a general election run, where he'll be looking to appeal to a wider swath of voters than just liberal Democrats. When asked about the conflict between his policy proposals and the governor's responsibility to balance the state budget, Newsom pointed toward his tenure as San Francisco mayor. "I said no more than I said yes ... we made investments but I also made a lot of cuts, and those were challenging," he said, noting it is likely the next governor will face an economic downturn. "I have no interest in going back to the old ways. I'm not a profligate Democrat. I have bold ideas. I want to be audacious in terms of the goals but I'm not reckless in that context. ... I really do think Gov. Brown has created a new norm of expectation in terms of fiscal discipline. And it's incumbent upon the next governor, I think, to model that." But perhaps nowhere is Newsom's conundrum more evident than around the issue of health care. It's an area that Newsom -- who prides himself on his wonky knowledge of details -- has studied deeply. But it could also pose big political problems: On the one hand, he's promised to support single-payer health care, a key issue for populist Democrats, including the powerful California Nurses Association; on the other hand, estimates of the program's cost run up to $400 billion a year, more than double the state's annual budget. Not to mention the political problem of deconstructing an entrenched health care system, and the reality of needing federal support at a time when California is locked in all-out legal warfare with the Trump administration. "I will be very thoughtful about how we deal with the issue. But I would argue what is reckless is doing nothing. Health care is devouring the state budget. Health care is in crisis in this country," he said, citing estimates that Republican tweaks to Obamacare could result in 30 percent premium increases next year alone. Newsom noted that he won't have the power to overhaul California's health care system alone -- it would require the buy-in of the federal government, as well as a host of changes to state and federal law. "My emphasis here is trying to bring everybody to the table and address this issue head-on -- and try to address this cost curve which is devouring the budget," he said. "This issue requires the executive branch ... to shape that conversation anew and phrase the conversation differently." Newsom made the comments over the course of a 90-minute bus ride Tuesday with a handful of reporters. During that wide-ranging conversation, the lieutenant governor vacillated between praising Jerry Brown (he called it a "gift" to work in the Capitol and learn from Brown over the past seven years) but also seeking to put some daylight between himself and the man he hopes to succeed. "He's been very stubborn in two areas where I'm going to be a little more indulgent: Higher education and workforce development, and early childhood education -- I just think those two areas we must do more and do better," he said. Newsom also pledged to "be a lot more intentional on the housing and homeless issue, which is not just about more resources but resourcefulness. There's a lot of money being spent in those areas ... (that's) not always been best spent." Newsom fell back on an old political trope, promising to help pay for many of these new or expanded programs by growing the economy and by using existing resources more creatively and efficiently. But when pressed, he acknowledged that none of his big goals could be accomplished quickly. He said some of them, like health care, would be part of the annual budget conversation. And Newsom said that when it comes to approach, he will govern differently than Brown. "I'm going to pull a lot more things into the governor's office and not just see them fester in the Legislature," Newsom said, alluding to the governor's practice of refraining from weighing in on most legislation until it reaches his desk. "I get the wisdom of why the governor does that -- I mean politically, it's very shrewd -- it allows you to pivot, it allows you more room. But there are certain issues that I think require the governor's office to be more and more proactive on the front end, as opposed to engaged on the back end." In that way, Newsom said he would model himself more on another California politician named Brown, who preceded Newsom as San Francisco mayor and is famous for his ability to make seemingly impossible deals happen. "Perhaps that's a contour of stylistic difference, and maybe it's more in line with where Willie Brown would find himself, rather than Jerry," Newsom said.